Select the appropriate court. All states impose residency requirements, although these requirements vary from state to state. Many states allow non-residents to file for divorce if they married in-state. If you married in another state, however, both spouses must have resided in-state for a statutory minimum period of time. If you file for divorce in a state where both spouses have resided for the statutory minimum period, select a district court sitting in the county where at least one spouse resides. Download and print an uncontested divorce petition or complaint form from the website of the county clerk of the state district court where you will file your petition. If it is not available online, visit the county clerk's office to obtain the form. If you have a child, your state may require you to complete additional forms to help the court assess child custody and child support arrangements. Complete the petition. The petition requires basic identifying information about you and your spouse such as your full names, your address, the date and jurisdiction of your marriage, your telephone number and your Social Security numbers. You will also have to provide grounds for the divorce. 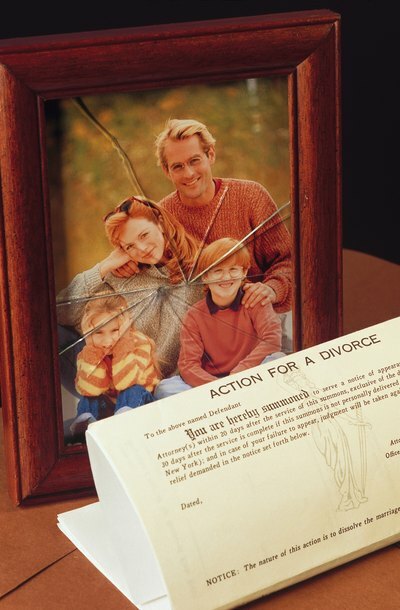 Since the divorce is uncontested, "irreconcilable differences" is a permissible ground for divorce in most states. If you have a child, you may be required to reveal detailed information about your finances and submit supporting documentation verifying this information. Copy the petition in triplicate and sign and date all three copies in the presence of a notary public. Only one spouse, known as the petitioner, must sign and date the form. Keep one copy of the petition for your records. File one copy of the divorce form with the state district court. Serve the remaining copy on your spouse through the use of an intermediary such as a county constable or a professional process server. The district court clerk can instruct you on the details of serving your spouse. You must pay a filing fee of up to several hundred dollars, depending on the state and county in which you live. State courts typically impose a 30- to 90-day waiting period, during which time your spouse is entitled to contest the divorce. Prepare a proposed divorce settlement agreement that describes the terms on which you and your spouse have agreed. Sign it and have your spouse sign it, in the presence of a notary public if state law so requires. There is no statutorily required format -- this document is simply a contract between you and your spouse. Some states may require supporting documentation such as tax returns to ensure that neither spouse is defrauding the other. The judge has the authority to reject your arrangements for child custody and support if he determines that they are not in the child's best interests. Prepare a proposed divorce decree. Although the exact format varies from state to state, the court clerk can provide you with a sample that you can modify to fit your circumstances. The decree contains a statement that the district court orders the dissolution of the marriage. Sign it and have your spouse sign it, in the presence of a notary public if state law so requires. File the divorce settlement agreement and proposed order with the court clerk after the statutory waiting period expires. If the judge approves your divorce settlement, he will sign the proposed order and have copies served on you and your spouse. If not, the court will modify the decree and return it to you for signature by both spouses before the judge signs it.